As soon as children start developing motor skills, at around the age of 3, they start showing preferences for a dominant hand. By the age of 5 or 6, your child’s hand preference becomes completely clear. If you see your child show preference for using the left hand, relax! There is absolutely no difference between a right-handed child and a left-handed child, so treat them the same. You can take a look at these tips on how to teach your left-handed child to write. Why are some children left-handed? A single gene could be passed on from parent to child to influence his hand use preferences. However, this is not conclusive. It is completely possible for 2 left-handed parents to have a right-handed child or two right-handed parents having a left-handed child. More boys are left-handed than girls. There is some research that suggests that the male hormone testosterone influences right and left-handedness. Some researchers suggest that all human beings are supposed to be right-handed, but some type of brain damage early in life causes left-handedness. However, this theory is not conclusive without hard evidence to support it. Some people who are naturally right-handed become left-handed because of the need to adjust to injury. The most important significant area of concern for parents of left-handed children is when they begin to write. Other than supporting your child and helping them practice writing, there are a number of steps you can take to teach your left-handed child to write. Once it is clear that your child is left-handed, inform the teaching staff at school so that they do not force the child to switch preferences to the right hand. This would only put pressure on the child and make him feel different from his peers. The teachers at school should continue to guide him in just the same way they would guide a right-handed child. This is most important. The way they grip the pencil at around the age of 6-7 years, is the kind of grip most likely to stay with them for life. Help him hold the pencil about half an inch above the tip so he can see what he is writing. Left-handed children have a tendency to “hook grasp” the pencil I.e. hold it in a way that curves the wrist inwards. You could carve a notch in the pencil or use a pencil grip to help tech them hold the pencil properly. Left-handed children find it very difficult to write on a paper which is placed vertically in front of them. You can help them by teaching them to tilt the paper away from their body, towards their right so that they can write smoothly without their writing getting smudged. Once your child moves from pen and paper to the computer, take advantage of all the advancements in technology. using a computer becomes much easier for a left-handed child once you invest in a left-handed mouse. Help your left-handed child develop the same kind of dexterity with his left hand as you have in your right. Tying laces can be particularly challenging for left-handed children. Demonstrate how in front of a mirror and have them mimic your actions. The markets are now filled with beautifully designed products catered to make life easier for left-handed people. From school essentials like left-handed notebooks, scissors, and pens, to objects like can openers or sports equipment, there are plenty of products designed specifically for left-handed people. It’s worth the money to ease your child’s frustration. Your left-handed child is no different from your right-handed one, so, do not make them feel any different or treats them differently. Make sure to also not force them to switch preferences to their right-hand. A left-handed child is everything a right-handed child is. 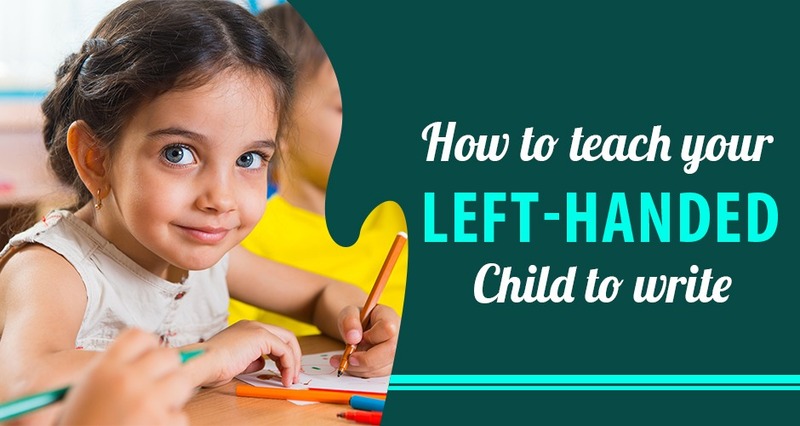 If these tips on how to teach your left-handed child to write come of use to you, please do share your thoughts with us.